The solution is to easy, to create Desktop shortcut to run Windows 8.1 WordPad or pin it on start, this solution is also for Windows 10! 1.) ... 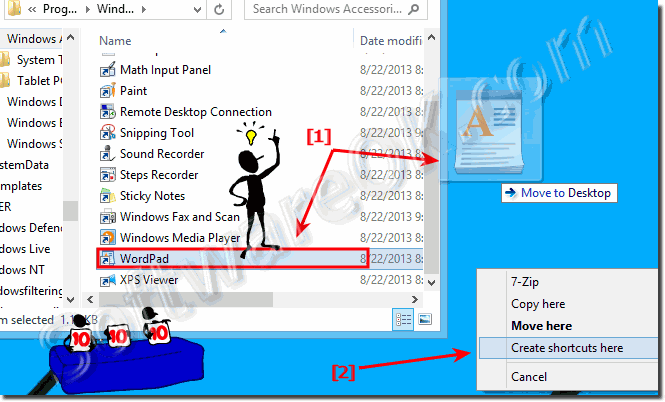 Create WordPad Desktop Shortcut via Windows Search! 2.) ... Desktop Shortcut for WordPad via Drag and Drop and MS-Explorer! 3.) ... Other Desktop Shortcuts for Windows 8.1/10! See also: ► Quick dock and compare the windows under Windows 8.1 / 10! 1.) Create WordPad Desktop Shortcut via Windows Search! If you want to pin the WordPad on Win 8.1 Start, please use the [Windows-Logo]+[Q] keyboard shortcut. For a WordPad Desktop-Shortcut please click (select) "Open File Location" (... see Image-1 Arrow-3) and Drag&Drop via right Mouse Button the WordPad.exe to the Desktop. 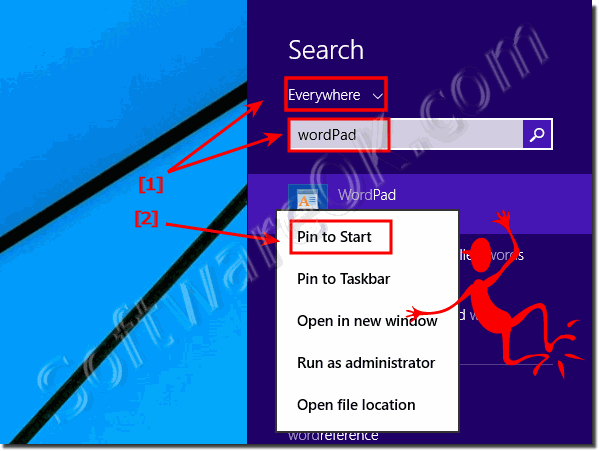 (Image-1) Windows-8.1 WordPad pin on start for an easy start! (Image-2) Desktop shortcut for the Windows-8.1 WordPad! 2.) Desktop Shortcut for WordPad via Drag and Drop and MS-Explorer! (Image-3) Windows Desktop Shortcut for WordPad! 3.) Other Desktop Shortcut for Windows 8.1/10! ► Desktop shortcut for windows fax and scan or pin to start or task-bar! ► Create Printers Folder Desktop Shortcut for Windows 8.1 / 10, How To! ► How to create a Windows 8 or 8.1 desktop shortcut for fast shutdown, log off, restart? ► Create Action Center Desktop Shortcut for Windows 8.1/8! 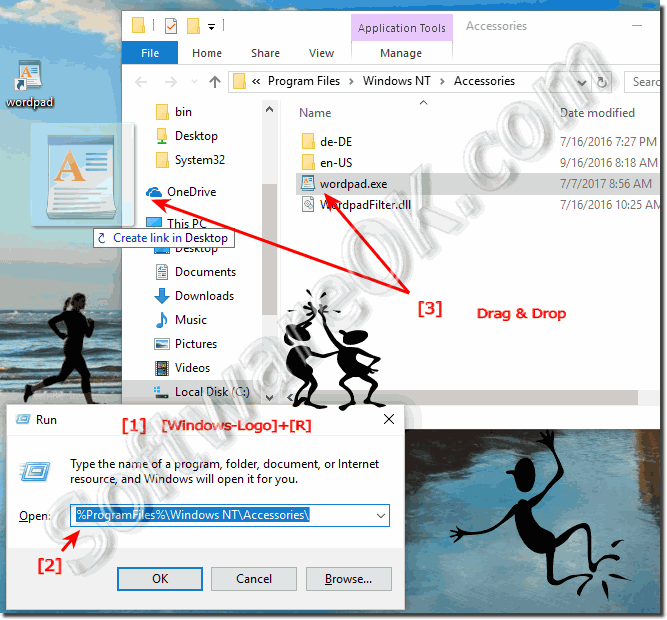 ► Direct access to Windows 8.1, 8 or Win 10 Sounds via desktop shortcut in Win 8.1? ► MS-Explorer search shortcut on the desktop in Windows 8.1/10! ► Create Desktop shortcut for Windows-8/10 Defender and pin to start menu! ► Create Windows 8 / 8.1 desktop shortcut for Program-Files and Program-Files(x86)! ► How to create a desktop shortcut for the Windows 8, 8.1 / 10 onscreen keyboard? Windows-8 - FAQ-220: Create Desktop shortcut to run Windows-8.1 WordPad or pin on start! Where is WordPad on Windows 10 and 8.1? Microsoft wordpad for windows 10 and 8.1 on the Desktop? Wordpad on windows 10 and 8.1 for the Desktop? Create desktop shortcut for wordpad in 8.1? Make shortcut to worpad on start menu windows 8? Pin shortcut to start windows 8 and 10? How to make desktop shortcut wordpad windows 8.1 and 10? Wondows 10 how to start wordpad? How to auto-run on wordpad? How to create shortcut key on desktop of wordpad on Windows 10 or 8.1? Wordpad for windows 8.1 and 10? Wordpad windows 10 and 8.1 for the Desktop? How to get word pad on my windows 10 and 8.1? Windows 8.1 wordpad or on Windows 10 or 8.1?